The passing of Woody Guthrie in October 1967, just as the great folk revival of the early ‘60s gave way to the rock revolution, left an enormous gap in the American music landscape—there wasn’t a singer-songwriter out there who didn’t acknowledge Guthrie’s influence. Many of the greatest, both from his own generation and those that followed, came together to pay their respects at multi-artist events held in New York in 1968 and LA two years later. Germany’s Bear Family Records has assembled all of the music from those shows, most of which was released on a pair of 1972 albums, now augmented by some 20 previously unreleased tracks. 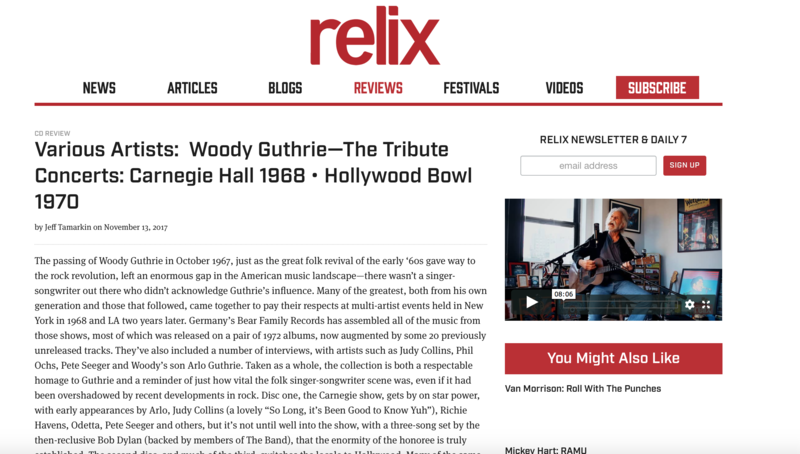 They’ve also included a number of interviews, with artists such as Judy Collins, Phil Ochs, Pete Seeger and Woody’s son Arlo Guthrie. Taken as a whole, the collection is both a respectable homage to Guthrie and a reminder of just how vital the folk singer-songwriter scene was, even if it had been overshadowed by recent developments in rock. Disc one, the Carnegie show, gets by on star power, with early appearances by Arlo, Judy Collins (a lovely “So Long, it’s Been Good to Know Yuh”), Richie Havens, Odetta, Pete Seeger and others, but it’s not until well into the show, with a three-song set by the then-reclusive Bob Dylan (backed by members of The Band), that the enormity of the honoree is truly established. The second disc, and much of the third, switches the locale to Hollywood. Many of the same artists reprise their roles. (Havens’ “Nine Hundred Miles” is a highlight.) And while there’s no Dylan, Joan Baez’s interpretations of Guthrie standards like “Plane Wreck at Los Gatos” and “Pastures of Plenty” are jewels, and the presence of Guthrie contemporary Ramblin’ Jack Elliott puts a stamp of authenticity on the proceedings.